As we informed you two weeks back, Coventry City claim they’ve been locked out of Ricoh Arena. 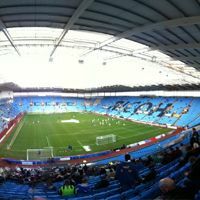 Again the stadium operator Arena Coventry Ltd assured on Thursday the door remains open, but again met with a definite ‘no’ from City, who claim they couldn’t break the deadlock for over a year now. Current plan of the club, previously suspected of planning a ground-share with Walsall, is to spend three upcoming seasons at a different venue (or venues), with intentions to eventually move to a new, purpose-built stadium. Chief executive Tom Fisher said "it's a new era and we retained specialists some months ago to advise us on where to build a new stadium for the club - and in the immediate Coventry area, by the way". Asked if there is any chance of Coventry playing at the Ricoh Arena next season, Fisher replied: "None. People have to understand we do not posture, we do not threaten, because that is not how you do business, you only do business in good faith. Always. "We have started the process of procuring land so that we can shift the new stadium build forward at a pace. The stadium will be in the Coventry area in accordance with Football League rules."